With increasing worldwide experience with laparoscopic adrenalectomy, pheochromocytoma is no longer considered a contraindication to laparoscopic surgery. Patients who may not tolerate an open operation are generally poor candidates for laparoscopic adrenalectomy. Abbreviations: OR, operating room; UTI, urinary tract infection; DVT, deep vein thrombosis; EBL, estimated blood loss. rate was 3%, average length of hospital stay was three days or less, and postoperative morbidity was experienced by 12% of patients. In the largest reported series, a combined experience of surgeons in Italy and the Netherlands by Lezoche et al. (21), a total of 216 laparoscopic adrenalectomies were performed using the anterior transperitoneal, lateral transperitoneal, or the posterior retroperitoneal approaches. The average operating time of all approaches was 100 minutes with a conversion rate of only 1.9%. Average hospital stay for all approaches was three to four days. 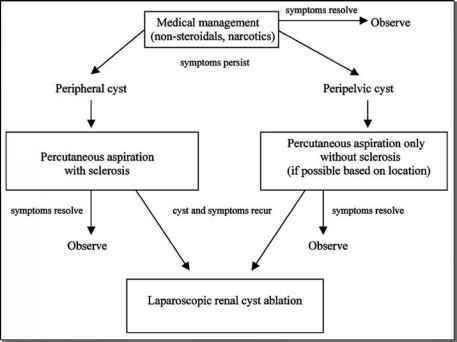 Studies comparing laparoscopic and open adrenalectomy have been conducted to determine if there are significant benefits provided by the laparoscopic approach (28,29,34-40). Overall, laparoscopic surgery requires longer operative time, particularly early in the learning curve. However, operative time decreases with increasing surgeon experience. In addition, the laparoscopic approach provides less blood loss, significantly less postoperative narcotic use, overall shorter hospital stay, and a faster return to normal activity. In one study, the costs of a laparoscopic and open adrenalectomy were comparable (41).